Multiple Myeloma (MM) is the most common primary cancer of bone in adults. The clinical presentation of MM is varied and depends on the sites and extent of involvement. Most importantly for chiropractors, the leading clinical symptoms of MM are related to bone neoplasm and may mimic pain of musculoskeletal origin. 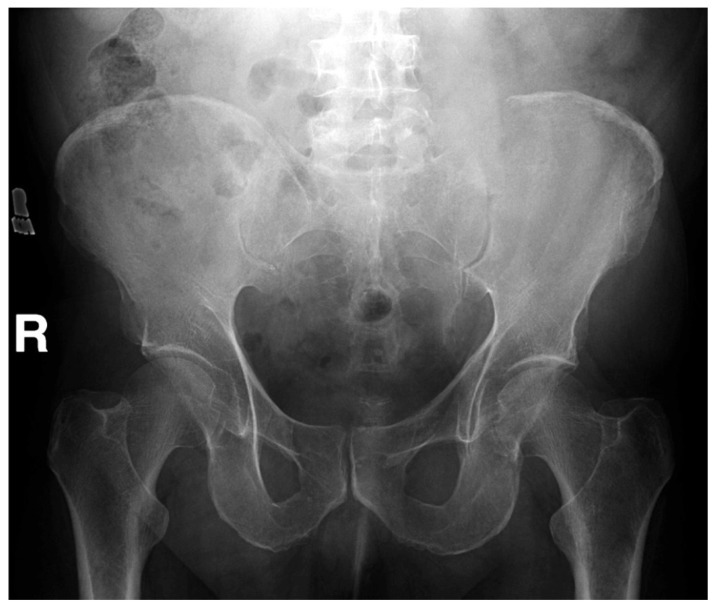 The following is the case of a 56 year old male chiropractic patient presenting with a 6 month history of sacroiliac joint pain previously diagnosed and managed unsuccessfully as a hematoma by multiple providers. Physical examination, imaging, and laboratory investigations confirmed a diagnosis of MM. The case report describes relevant pathophysiology, clinical presentation, imaging, and management for MM, while illustrating key issues in patient management as they relate to chiropractic practice and the recognition of pathology in the context of musculoskeletal pain. 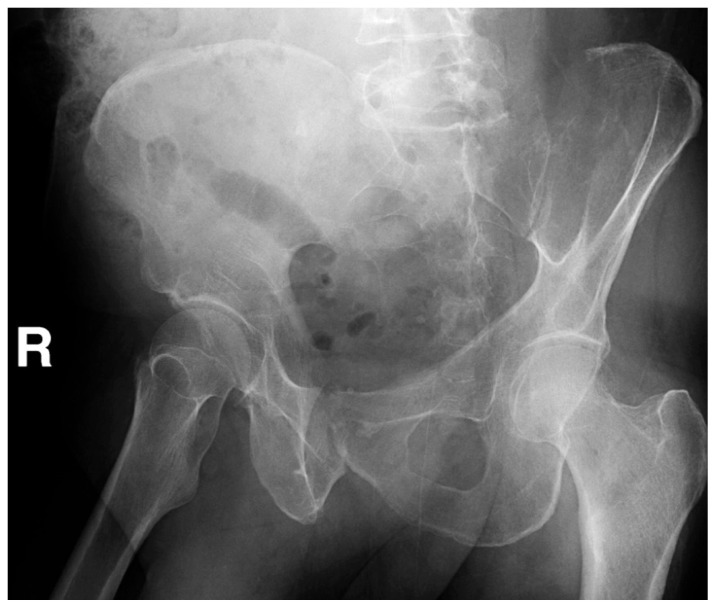 A 56 year old male presented to a tertiary care centre with a six month history of pain in the left gluteal/sacroiliac joint region. The complaint progressively worsened following its onset after heavy lifting. His pain varied in intensity and was often exacerbated following activity. The most recent and intense exacerbation occurred in the week prior to his hospital presentation and was insidious in onset. Symptoms included radiation of pain down the left leg of two days duration described as stabbing in nature with an intensity of 7/10. The patient did not report any associated numbness or paresthesias and was not experiencing any weakness. Aggravating factors included sitting and lying supine. In addition, he reported occasional waking during the night due to pain. The patient reported a mass in the left gluteal region which had slowly increased in size over the preceding month. This mass was diagnosed and managed as a hematoma 6 months prior to his hospital presentation. His family physician prescribed Tylenol-3 and physiotherapy. Two visits with a physiotherapist consisting of a passive assisted stretching technique and traction aggravated his complaint. He then consulted a chiropractor who treated him with spinal manipulative therapy for more than 12 visits over 6 weeks. The patient reported minimal short-term relief over this period of time with no change in the soft tissue mass. Following his lack of response to conservative chiropractic management, the patient was referred by the chiropractor to the local hospital emergency department for further medical assessment. The patient reported his health status as otherwise healthy. He denied a history of fever, night sweats, or recent changes in his weight and did not report any bowel or bladder dysfunction. A systems review was unremarkable. Upon hospital presentation, examination revealed a palpable warm soft tissue mass in the left buttock region, approximately 10 cm in diameter. Hip and lumbar spine ranges of motion were pain-free and within normal limits. Neurological examination including sensory, motor, and reflex testing of the upper and lower limb was unremarkable. Straight leg raise was negative bilaterally. Sacroiliac (SI) compression and FABER (Flexion Abduction External Rotation) were both positive on the left, reproducing pain over the patient’s left SI joint. No tenderness was noted on lumbar spine palpation. An abdominal examination failed to reveal any tenderness or palpable masses and there was no evidence of lymphadenopathy peripherally. Vital signs were within normal limits. A computed tomographic (CT) examination of his abdomen and pelvis demonstrated a 12 × 7 × 12 cm soft tissue mass causing expansion and cortical destruction of the superomedial aspect of the left iliac bone, including the sacroiliac articular surface, with extension into the gluteus medius muscle (Figure 1). Additionally, small osteolytic lesions were noted in the inferior aspect of the S1 vertebral body and in the right iliac bone. No evidence of intraabdominal or pelvic adenopathy was noted. A bone scan revealed decreased uptake in the left iliac bone, corresponding to the location of the soft tissue mass. A chest CT revealed no evidence of metastatic disease or primary lesions in the lung parenchyma. 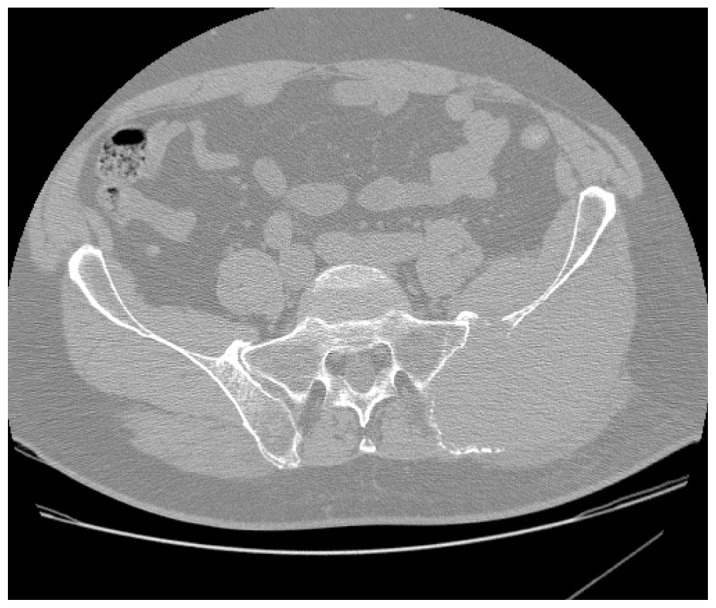 A later radiographic skeletal survey demonstrated an osteolytic lesion involving the left posterior iliac crest corresponding to the CT finding that was visible on plain radiographic examination (Figure 2) Differential diagnoses at this time included; plasmacytoma/multiple myeloma, primary sarcoma, and metastatic disease. The patient was admitted to hospital for further diagnostic testing. Peripheral blood smear and other laboratory testing revealed a normocytic normochromic anemia, marked rouleaux formation, and elevated protein levels (with an IgA-kappa light chain monoclonal spike on protein electrophoresis). A bone marrow aspirate demonstrated plasma cells making up over 50% of the total cell population. These findings were consistent with multiple myeloma given the osseous lesions noted in the left iliac bone and S1 vertebral body. Once admitted to the hospital, the patient was referred for consultations with hematology and oncology. He received transfusions to correct his anemia and was administered his initial 4 day cycle of chemotherapy. His pain was controlled effectively through the use of regular strength Tylenol. A referral was made to radiation oncology for consideration of radiation therapy. The patient received 6 cycles of chemotherapy, subsequent radiation therapy and autologous stem cell transplant over the duration of one year. Despite some initial improvement in symptoms and activities of daily living, upon last follow up new lesions were discovered in his liver. His prognosis for recovery at the time of last follow-up was poor. The pathophysiology of MM begins with cytogenetic changes that occur in the plasma cell lineage within the bone marrow. Monoclonal expansion of myeloma plasma cells within the bone marrow interferes with the production of normal blood cells. Myeloma cells produce abnormal immunoglobulin (M protein), light chain proteins (κ and λ), and other factors, such as cytokines. Excessive M protein causes hyperviscosity of the blood, whereas excessive light chains cause end organ damage (for example renal failure). Lesions of bone are largely caused by the release of cytokines  that promote bone resorption via upregulation of osteoclast activity, differentiation, and maturation. [7, 9] Unrestrained osteoclast activation leads to the release of mediators that stimulate further clonal proliferation of myeloma cells and subsequent tumour growth. The result is a vicious cycle of bone destruction and tumour growth, leading to further bone destruction. This patient also experienced a 6 month history of worsening pain and a growing mass. The mass was initially diagnosed as a hematoma and was unresponsive to conservative management. The presence of a growing mass is a red flag, particularly where a diagnosis of hematoma is given. The natural history of a hematoma indicates that the mass should have diminished in size, rather than increase over 4–6 weeks. Failure to respond to conservative care is another significant red flag. The Glenerin Guidelines (1996) suggest that lack of improvement after 12 visits may imply the diagnosis is incorrect, the treatment is incorrect, or there is a co-existing condition. After 6 weeks of no improvement, a referral is warranted. Guidelines, however, do not take the place of clinical reasoning. Clinical decision making is guided by case complexity, the best available evidence, provider expertise and experience, and patient preference and beliefs. [20-22] A decision must be made prior to implementation of care regarding expectations for improvement based on available evidence regarding natural history and individual patient factors or case complexity. A lack of expected improvement warrants a change in treatment approach or referral. [20-22] Information regarding a patient’s progress is obtained from continued frequent evaluation; even when a diagnosis has been provided by another health professional. It is the consulting health professional’s responsibility to re-evaluate and formulate a diagnosis that is consistent with history and physical examination findings as well as the patient’s response to management given previous diagnoses. For the patient in this case who was treated for pain of musculoskeletal origin and a hematoma, the natural history of the complaint should have been considered. Combined with his emerging symptoms consistent with pathology, his lack of response to conservative management should have resulted in an earlier decision for imaging or referral. Within the primary care setting, the suspicion of MM may be based solely on information gathered in the history. When the most prominent symptom is pain, a physical examination is performed to confirm or rule out pain of musculoskeletal origin; however it is important to note that the pain associated with neoplasm of bone can be reproduced much like pain of musculoskeletal origin. Pain precipitated by range of motion is a common symptom in patients with bone neoplasm, including multiple myeloma. [8, 12] A musculoskeletal examination of the patient in this case reproduced the chief complaint, emphasizing that positive musculoskeletal provocation tests do not rule out pain of pathological origin. In addition, chronicity of a complaint also does not rule out pain of a pathological origin. The authors of a retrospective case review involving primary sarcomas of the pelvis (excluding multiple myeloma) suggested one of the reasons for delayed diagnosis was that primary care practitioners were mislead by chronicity which is less consistent with rapidly growing malignancies. In the pelvis, tumours can occupy larger areas without detection due to the relatively large surrounding space. This patient developed chronic pain due to the lack of attention to his growing tumour which was originally diagnosed and managed as a hematoma, further placing him outside of the typical presentation of malignancy. Imaging plays a role in the diagnosis and prognostic classification of multiple myeloma. Radiography is of key interest to chiropractors as many have access to this form of imaging. Clinical indications for radiographic imaging include the presence of red flags and lack of response to treatment. Radiographic findings of multiple myeloma include punched out osteolytic lesions without reactive sclerosis, osteoporosis, and pathological compression fractures. [2, 8] The most frequently involved bones are the skull, pelvis, ribs, sternum, and long bones. Approximately 79% of patients have positive radiographic findings at the time of their diagnosis. Up to 25% of those with an absence of radiographic findings subsequently developed positive findings in follow-up examination, emphasizing the lack of sensitivity of radiographic imaging in early phases of the disease. [8, 11] Radiography also lacks sensitivity in identifying myeloma-related osteoporosis, as 50% trabecular loss is required for its visualization. Due to this lack of sensitivity, additional imaging such as Computed Tomography (CT) or Magnetic Resonance Imaging (MRI) may be required when suspicions of multiple myeloma are high. [8, 11] CT is able to provide detailed information regarding the extent of cortical involvement of the tumour, whereas MRI is able to demonstrate marrow infiltration as well as diffuse patterns of infiltration that may not be adequately visualized using radiographic imaging alone. [1, 11] In addition, MRI is able to demonstrate the extent of soft tissue and neurovascular involvement. On MRI, myeloma tumours have a low T1 and high T2 weighted signal intensity with enhancement after the administration of intravenous contrast. As there is no increase in osteoblastic activity, bone scans are of less importance in MM and may result in false negative findings, leading to misdiagnosis. 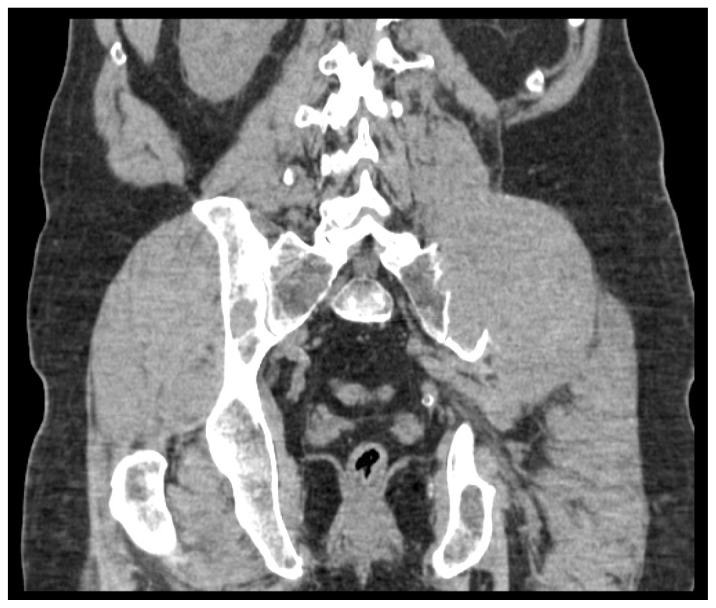 In the diagnosis of the patient in this case, CT, plain radiographic imaging, and bone scan provided findings that were consistent with findings of MM; however earlier referral for radiographic imaging or diagnostic ultrasound for his growing mass may have lead to more prompt diagnosis and management. Laboratory tests used to screen for MM include a complete blood count (CBC), peripheral blood smear, erythrocyte sedimentation rate (ESR), chemistry panel (including electrolytes, calcium, uric acid), and serum and urine protein electrophoresis. For confirmation of a diagnosis of MM, a bone marrow biopsy and immunofixation should also be performed. A CBC will demonstrate normocytic normochromic anemia in most patients8 and may also reveal leukocytopenia and thrombocytopenia. Rouleaux, a characteristic finding of MM, will be seen with a peripheral blood smear in roughly half of all patients. ESR is often elevated. [8, 13] A chemistry panel will reveal hyperuricemia and hypercalcemia  and serum creatinine will be elevated in the case of renal insufficiency (due to renal failure, myeloma kidney, hypercalcemia). Serum albumin may also be decreased.13 Protein electrophoresis will demonstrate a characteristic M-spike in the serum and/or urine of most patients, indicating monoclonal gammopathy. [8, 13] Bone marrow biopsy confirms a diagnosis of multiple myeloma through the demonstration of malignant plasma cell infiltrates. In the current case, laboratory findings were used to rule out the differential diagnoses and confirm the diagnosis of multiple myeloma following the discovery of a tumour in the posterior ilium. The diagnosis of MM is dependent on findings from a number of investigations including clinical examination, imaging, and laboratory testing. As chiropractors, the clinical picture and imaging are used to indicate the need for referral for appropriate follow-up diagnostic testing. In order to properly diagnose MM, World Health Organization criteria include plasmacytosis, an M spike on serum, plasma, or urine protein electrophoresis, and plasmacytoma proven on biopsy. [10, 13] Additional findings considered in the diagnosis of MM are osteolytic lesions and decreased polyclonal immunoglobulins. Differential diagnoses vary depending on the clinical picture. For chiropractors, relevant differential diagnoses will be based on initial imaging findings of an osteolytic bone tumour or the patient’s clinical presentation. Differential diagnosis of an osteolytic bone tumour in a patient over the age of 50 includes metastasis, multiple myeloma, and lymphoma. Staging of MM is achieved using radiographic skeletal surveys and further CT or MRI and is helpful in the development of a plan of management and in determining a prognosis. In addition to a discussion on relevant clinical presentation, diagnosis, treatment, and prognosis of multiple myeloma, this case of a 56 year old male chiropractic patient with multiple myeloma illustrates key issues in patient management as they relate to chiropractic practice and the recognition of pathology in the context of musculoskeletal pain. An estimated 0.7% of patients with back pain in the primary care setting have neoplastic disease. As diagnosticians, the chiropractor’s role is to rule out these serious causes for a patient’s pain. Due to the low sensitivity of red flags, their absence cannot be used exclusively to rule out significant pathology. [17, 18] Further complicating the elimination of a pathological diagnosis is the fact that provocation of pain during the musculoskeletal examination does not rule out the presence of serious pathology, nor does the chronicity of the complaint. Decisions must be made prior to implementation of care regarding expectations for improvement based on available evidence regarding natural history, provider experience, and patient-related factors. [20, 21]With continued frequent evaluation, the recognition of a lack of expected improvement warrants a change in treatment approach or referral. [20, 21] This case illustrates that without proper benchmarking of care, pathology can be missed, even in the event of the inclusion of multiple health professionals. For chiropractors, understanding the limitations of initial history and examination findings, as well as the importance of ongoing re-evaluation in the detection of a lack of expected improvement is crucial to appropriate patient management and the recognition of underlying pathology in the context of seemingly musculoskeletal pain presentations. examination in patients with multiple myeloma and implications for therapy. PET/CT and MR imaging in myeloma. Beers MH, Porter RS, Jones TV, Kaplan JL, Berkwits M.
The Merck Manual of Diagnosis and Therapy. 18th ed. New Jersey: Merck Research Laboratories; 2006. pp. 1129–1131. Dores GM, Landgren O, McGlynn KA, Curtis RE, Linet MS, Devesa SS. incidence and survival in the United States, 1992–2004. Ashcroft AJ, Davies FE, Morgan GJ. Aetiology of bone disease and the role of bisphosphonates in multiple myeloma. Berenson JR, Rajdev L, Broder M.
Bone complications in multiple myeloma. of spine involvement in patients with multiple myeloma. Wurtz LD, Peabody TD, Simon MA. Delay in the diagnosis and treatment of primary bone sarcoma of the pelvis. He Y, Wheatley K, Glasmacher A, Ross H, Djulbegovic B. Early versus deferred treatment for early stage multiple myeloma. Shipman CM, Oyajobi BO, Mundy GR. Advances in the management of myeloma bone disease. McGraw Hill Professional; 2009. p. 959.